The 2015 Nobel Prize in literature has been awarded to Belarusian writer Svetlana Alexievich "for her polyphonic writings, a monument to suffering and courage in our time," the Nobel Committee said on Oct. 8, the news agency TASS reports. 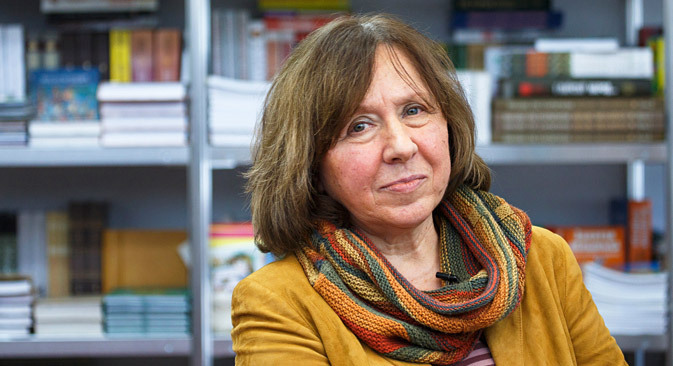 Alexievich, who was born in western Ukraine in 1948 and grew up in Belarus, has spent the past 35 years exploring Soviet identity through the more challenging and less charted terrain of the interior life. Through real voices, she explores the psychological journey of the Soviet, and more importantly, post-Soviet, people. Alexievich was considered a strong candidate for the Nobel Prize for Literature in 2013 before Alice Munro was awarded the prize. Her new work Second-Hand Time, the Modern History of Russia and the former Soviet Union in Dramatic Confessions has been published in Russia, Sweden and Germany. She is best known for her books War's Unwomanly Face, Zinky Boys, Voices from Chernobyl, etc. "I have been in this capacity (as the Nobel prize winner) for two hours only, I don't know what I'll do next," Alexievich told reporters in Minsk on Oct. 8, when asked about her future plans. She said the Russian culture minister has already congratulated her. The Belarusian president and culture minister have yet to do so. "No, the president has not congratulated me, neither the Belarusian, nor the Russian one," she said.